Looking towards Odeonsplatz during the state funeral of Gauleiter Adolf Wagner on April 27, 1944. The site after the war with the monument to Schiller dating from 1863 which had been moved to the northeastern end of Maximiliansplatz for traffic reasons in 1959. 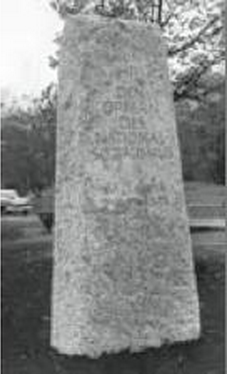 A temporary memorial was placed on the site in 1965. After Andreas Sobeck’s memorial had been erected in 1985 the granite stone was given a new inscription and moved to Platz der Freiheit (Freedom Square) in the district of Neuhausen, where it serves as a memorial to the members of the resistance who fell victim to the Nazi regime. The memorial is situated diagonally opposite from the former Wittelsbach Palace, Gestapo headquarters and gaol in Munich since 1933. The memorial information slab describes the site as "a place of destruction, intimidation and terror against political dissidents, against racially and religiously discredited minorities and against people who have been persecuted because of their sexual orientation or disability." Looking as if it was set up as a mere afterthought, an eternal flame burns in memory of victims of the Nazis. When it was first erected, it was shut off each night until enough of a protest had been made. By October 2012 it was missing altogether but has since reopened. A prominent victim of the “Aryanisation” carried out between 1933 and 1945 which took the form of a looting campaign of enormous proportions was the “Modellhaus Adolf Rothschild”, formerly the Palais Eichthal, a dressmaker’s and furrier’s shop located at Brienner Straße 12. Owing to a dramatic fall in sales, Adolf Rothschild was forced to stage a clearance sale in September 1938 and thus sell the business for well below its value. Although Rothschild himself managed to emigrate to London, most of his assets were confiscated. 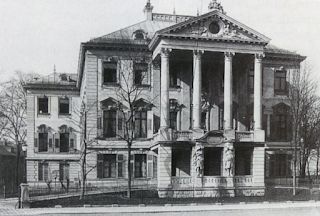 The Wittelsbacher Palais had been located on the north eastern corner of Briennerstraße and Turkmenstraße, and from 1887 to 1918 the palace was the residence of Queen Mary IV and III and her family. It was here that the Bavarian Secret Police moved its offices in 1933 from the Polizeipräsidium on Ettstrasse, transforming itself into the GEheimeSTAatsPOlizei. The photo on the right clearly shows the Gestapo prison in the park of the former Wittelsbacher palace. From 1933 onwards the Wittelsbach Palais in Brienner Straße 22 was the headquarters of the Bavarian Political Police, which later became part of the Gestapo (Geheime Staatspolizei or secret state police). This regional headquarters of terror spread fear and dread among the population. Anyone resisting the regime in Munich fell into the clutches of the Gestapo. The carpenter Georg Elser, for example, who attempted to assassinate Hitler on 8 November 1939 by planting a bomb in the Bürgerbräukeller, was interned in the Sachsenhausen concentration camp after weeks of interrogations in Munich and Berlin. He was later taken to Dachau, where he was shot by the ϟϟ shortly before the end of the war. The Gestapo officials in the Wittelsbach Palais were also responsible for issuing orders to compile death lists and for dispatching the deportation orders that led to the annihilation of Munich’s Jewish community. 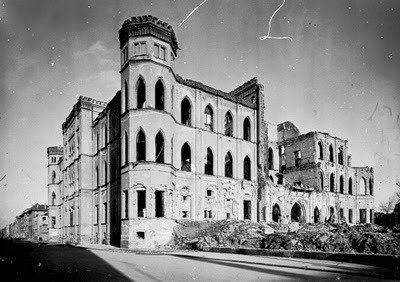 In 1944 the building was destroyed by Allied bombing. 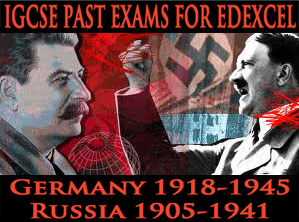 On the right is a short introduction related to the establishment of the Gestapo. 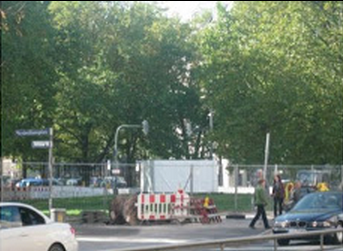 Today the site is occupied by the Bayerischen Landesbank. 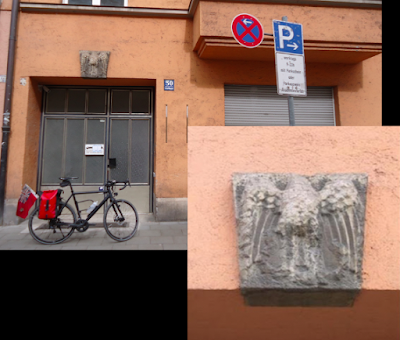 The original building was destroyed in bombing in 1944; this plaque on its façade on the corner of Brienner and Türkenstrasse marks the former site. Although the site is infamous as a place of torture and imprisonment of the enemies of the regime, the plaque seems more concerned about ignoring this inconvenient fact to advertise the bombing by the British and Americans. "prisoners had open wounds all over their bodies, primarily on their backs... They were forced to lie with such open wounds on dirty cots. I was often witness to such scenes, especially at the time when the focus was on the BZK. I know of some six people among this group of prisoners dying because they were so badly mistreated. And as I learned later, various others died whilst being transported to Dachau. In 1955 there were discussions on building a cultural or popular education centre on the site, but it was sold to the BayernLB (Bank of Bavaria) in 1958. Directly behind was to have been the site of Hitler's mausoleum. Upon visiting Napoleon's tomb after the fall of France, Hitler commented, "My life will not end in the mere form of death. 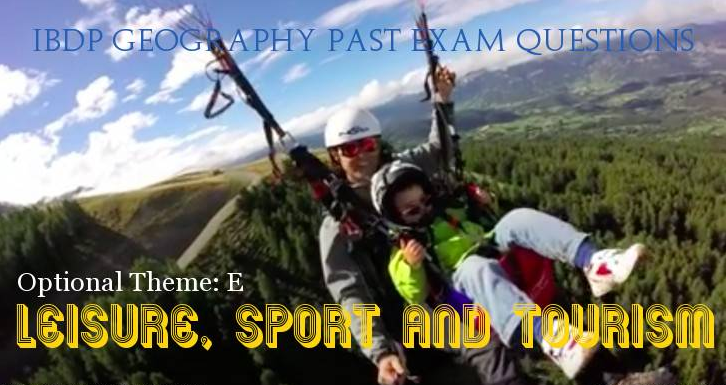 It will, on the contrary, begin then." 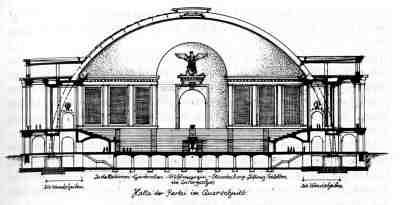 His interest in immortality was shown in his plans for the gigantic mausoleum which would dwarf the Frauenkirche and last, he said, "until the end of time." His personal sketch of the plans dated 21 June 1939 may be found at the Hauptstaatsarchiv, Munich. The mausoleum was to be connected to the planned Halle der Partei at Munich by a bridge over Gabelsbergerstraße (where, at no.37, the Nazis’ Main Office for Local Government played key roles in the unrestrained plundering of the Jews, directed at private property, art collections and libraries, houses, flats and land, but also at commercial enterprises.) 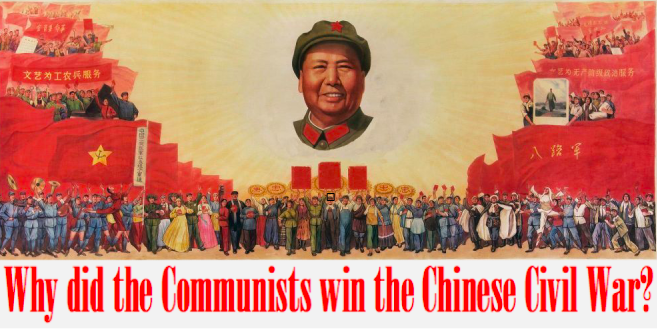 to become a party-political cult centre in the city regarded by Hitler as the home of the Nazi party. Hitler relaxed with a sketching pad, deftly drawing a Party Forum that should grace Munich after his death – a parade square, Nazi Party office buildings, a bridge across Gabelsberger Strasse, and his own mausoleum, dwarfing the city’s famous Frauenkirche and built to ‘last until the end of time.’ It was a concrete sign of his optimism about the future. The dimensions were slightly smaller than the Pantheon. The oculus in the centre of the dome was to be one metre wider in diameter than that of the Pantheon (8.92 metres) to admit more light on Hitler's sarcophagus, placed immediately under it on the floor of the rotunda. The modest dimensions of the structure and its lack of rich decoration are at first sight puzzling in light of Hitler's predilection for gigantic dimensions, but in this case the focal point of the building was the Führer's sarcophagus, which was not to be dwarfed by dimension out of all proportion to the size of the sarcophagus itself. Likewise, rich interior decoration would have distracted the attention of "pilgrims" Giesler's scale model of the building apparently pleased Hitler, but the model and plans, kept by Hitler in the Reichskanzlei, are are now probably in the hands of the Russians or have been destroyed. Standing in front and as it appeared during the Nazi era. One of the more unexplored yet frightening aspects of the Nazi years is the conduct of the doctors during those years. Many of them abandoned the traditional guiding norms for the practice of medicine, archaically expressed in the Hippocratic oath, and proposed, carried out, and cooperated with medical experiments without the consent of subjects and with little promise of any contribution to medical science. Many also participated in research and other medical activities, such as euthanasia and mass sterilization, whose purposes had nothing to do with a contribution to medical knowledge that would eventually save or improve life, but were simply for the manipulation and killing of persons. These activities quickly fell under the control of Nazi ideology, with no protest on the basis of the norms of medical practice by societies of medical doctors and psychiatrists, and with little, albeit costly, protest by individuals. Established after plans of Roderich Fick, this building was in the possession of the Nazis from November 3, 1935 when it was inaugurated in Hitler's presence. Hitler liked the building so much that he made Fick a professor of architecture at Munich's Technical University; in 1939 he even appointed Fick Reich Architect for Linz and had been commissioned to work on a number of projects on the Obersalzberg. Bernhard Bleeker designed the emblem above the entrance which still sports the two snakes and faintly preserves the title. Located today on Brienner Straße 23, it now serves as Ober-Österreich-Haus. The emphasis on "German" proclaimed the medical group's status as a pure, 'aryanised' organisation by which time Jews had been prohibited from practising medicine. 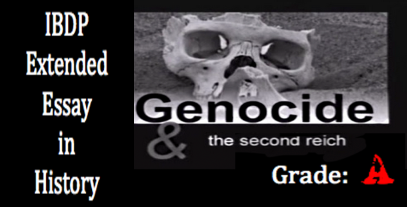 The members of this organisation included not only the ideologues of racially based medicine but also the advocates of medical experiments on humans, forced sterilisation and 'euthanasia'. In 1933 Jewish doctors were deprived of their licences to practise under health insurance plans. From 1938 onwards they were only allowed to practise as “providers of treatment” for Jewish patients and not permitted to use the title “doctor”. The Association of Health-Fund Physicians of Germany, which had its Munich headquarters in the House of German Physicians, inaugurated in 1935, and the Association of National Socialist German Physicians at Karlstraße 21 played a key role in these measures. The members of these organisations included not only the ideologues of racially based medicine but also the advocates of medical experiments on humans, forced sterilisation and “euthanasia”. In his thinking and practice, the German doctor must become closer to nature. He should no longer swear solely and only by the dogma of his university acquired Schulmedizin-based knowledge. 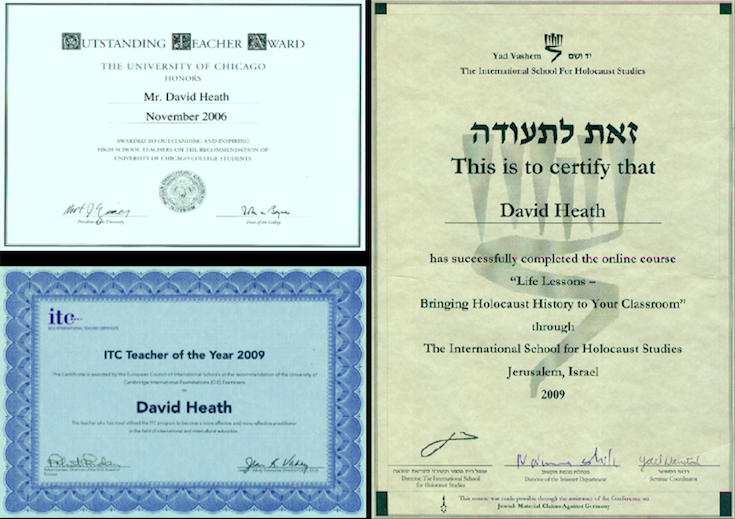 Rather, he should also master the methods of Naturheil, homeopathy, and Volksmedezin. We National Socialists subscribe neither to economic nor intellectual dogma, we only know one dogma: The well-being of the German Volk. Ironically enough, directly across the street from the former Gestapo HQ (right) and next door to the former House of German Doctors is the current Israeli Consulate with Drake Winston standing in front, thus explaining the constant police presence. 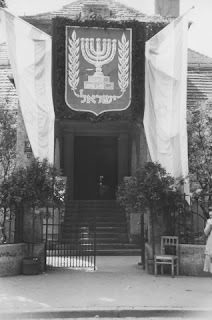 The first Israeli consulate in the Federal Republic of Germany opened in Munich at 11 Maria-Theresia Street, closing June 30, 1953. Looking down the street towards Karolinenplatz, much has changed postwar; only the gate on the left and the balcony offer points of continuity. The site of the former headquarters of the Upper Bavarian branch of the German Labour Front (DAF) on the left, whose goal was to bring together in a single organisation all »working Germans«, regardless of their training, social status or actual profession, and indoctrinate them with Nazi ideology. The DAF was made particularly attractive by the leisure activities and holidays offered by its Strength through Joy organisation (Kraft durch Freude– KdF). 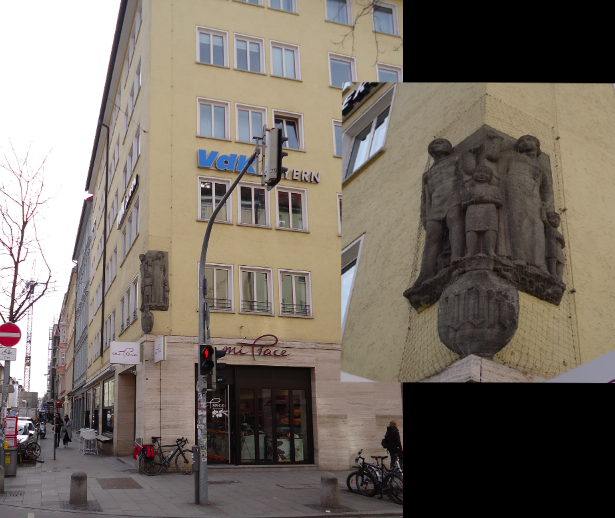 They were located here at Brienner Straße 26–28 when, 1935 the KDF took over the business premises and house of the Jewish antiquarian bookseller Jacques Rosenthal who was forced to sell the building to the Reich Leadership of the NSDAP for well below its value. Rosenthal died on October 5, 1937 in Munich, his wife Emma emigrating to Zurich in December 1939. Next door shown on the right is the former site of the German Labour Front and the offices of the Gau for Munich-Upper Bavaria, formerly the Palais Matuschka. After the free trade unions were disbanded in May 1933, their assets were confiscated and many trade-union functionaries were arrested. 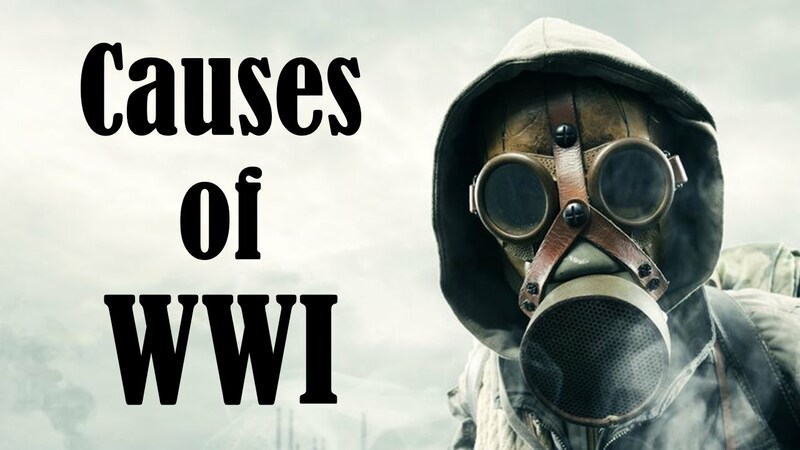 They were replaced by the German Labour Front (DAF), whose goal was to bring together in a single organisation all “working Germans”, regardless of their training, social status or actual profession, and indoctrinate them with Nazi ideology. The DAF was made particularly attractive by the leisure activities and holidays offered by its “Strength through Joy” organisation (“Kraft durch Freude” – KdF). 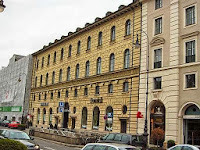 The headquarters of the Upper Bavarian branch of the DAF were located at Brienner Straße 26–28, and in 1935 the KdF took over the business premises and house of the Jewish antiquarian bookseller Jacques Rosenthal at Brienner Straße 26. Rosenthal was forced to sell the building to the Reich Leadership of the NSDAP for well below its value. The headquarters of the head of the Woman's Bureau in the German Labour Front and, from 1934 onward, Reichsführerin of the National Socialist Women’s Association. The Nazi women's movement (NSF) was the women's organisation of the Nazi Party founded in October 1931. In fact, the political influence of the NSF within the NSDAP and the power of the state tended to be zero, which may have been due to the national socialist image of women, which did not envisage a power and political participation for women. The "German woman" was defined as a housewife and mother, a roll distribution, which was also propagated by Nazi women. The general care and the education of the children were called "feminine habitat" and women's mothers' training courses, which had been attended by every fifth woman (over 20 years) until 1937, were formally established based primarily on the book Adolf Hitler, the German Mother and her First Child by Johanna Haarer, a copy of which our midwife lent me. From February 1934 to the end of the Second World War 1945, the Nazi women's leadership was led by the "Reichsfrauenführer" Gertrud Scholtz-Klink, who also headed the DFW. Scholtz-Klink had been charged with the responsibility of persuading women to work for the good of the Nazi government; its offices provided training programmes relating to women's domestic work. In 1938, she argued that "the German woman must work and work, physically and mentally she must renounce luxury and pleasure", though she herself enjoyed a comfortable material existence. Unlike man, as Alfred Rosenberg once put it, woman thinks 'lyrically’ and not 'systematically’, 'atomistically’ and not 'synoptically’, whatever that may mean; and while he saw it as one of woman’s main tasks 'to preach the maintenance of the purity of the race’, the Reich Women’s Leader Gertrud Scholtz-Klink, in full agreement, complained especially of the absence in sober modern times of the sacred racial function and significance of women and called upon them 'to become once more the priestesses of the family and nation’. She eventually served eighteen months in gaol after the war (only having been caught whilst in hiding in 1948 after witnesses had claimed she had died in the bunker with Hitler) and remained an unrepentant Nazi until her death in 1999, twenty years earlier In she had dedicated her book The Woman in the Third Reich to “the victims of the Nuremberg trials.” The building itself today dates from 1957 after the original was bombed during the war. Palais Asbeck-Lotzbeck, located at Karolinenplatz 3, had served as the Nazi accounting office until suffering damaged in 1944 and 1945 with its ruins torn down and made the site in 1955 of the Amerika-Haus. Amerika Haus flying the Canadian flag upside-down. Although not particularly proud of the flag itself, it does represent a country instrumental in liberating Germany and Western Europe from Nazi tyranny. 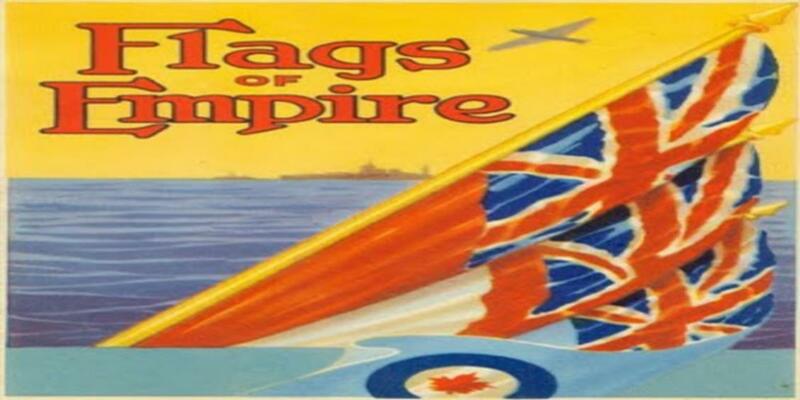 When informed of it, they replied that it was given to them by the Canadian consulate, could only be flown upside-down and that one shouldn't be "overly critical" about Germans choosing to fly the current flag of a country that lost 43, 600 men ridding the world of fascism. Formerly the site of Palais Törring built in 1812 from the plans of Karl von Fischer, this was the site of the Supreme Court of the NSDAP headed by Walter Buch (whose daughter ended up marrying Martin Bormann). Located at Karolinenplatz 4, it was responsible for settling internal party conflicts and disciplining individual members whose behaviour might be damaging to the party. 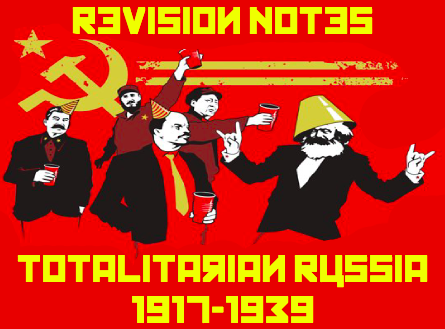 By the constitution of the NSDAP of July 21, 1921, a conciliation committee and a committee of inquiry were set up, which had to assess all new admissions and decision-making procedures. Adolf Hitler saw these committees as an instrument to prevent internal opposition. After the founding of the NSDAP in 1925, the two committees were merged into the examination and conciliation committee (USCHLA). 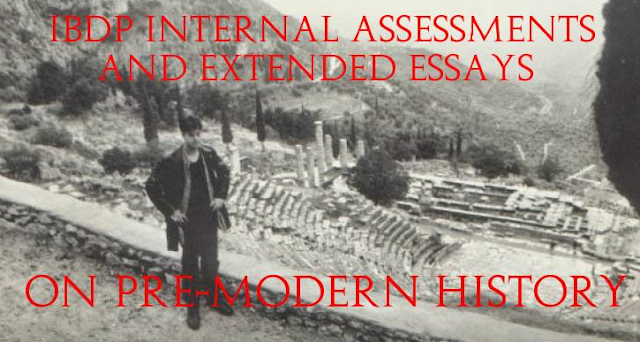 According to the statutes of 25 May 1926, the main task of the new body was the examination of admission and exclusion procedures and the mediation of intra-party disputes. On local and regional level local USCHLAs were formed, which the USchlA in Munich headed. The committees included a chairman and two assessors. In order not to bind the members of the committees as an executive organ of the party leadership, the exclusion was not precisely defined, which led to the judges having more liberties. In 1929, new guidelines were issued for USCHLAs, which were based on the criminal code of procedure. In 1931 the jurisdiction was extended to the SA and ϟϟ. After the introduction of the Law for the Protection of the Unity of the Party and the State in December 1933, the USCHLA was renamed Party Attacks, with the Supreme Party Judge having several chambers. 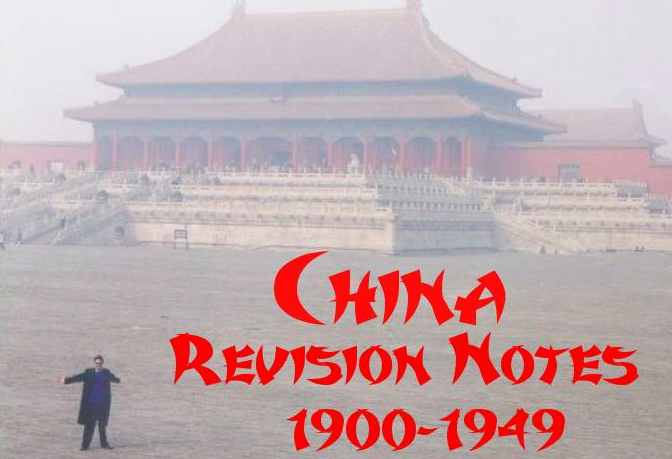 In 1934, the procedures were aligned more to criminal proceedings by means of new directives. The criminal catalogue was expanded and re-admissions allowed. The party reports were regarded as a separate branch of the state courts, state courts had to provide legal assistance, from 1936 judges who were jurists were the right to sworn witnesses and experts. Efforts to create a separate jurisdiction for the SA failed due to the veto of Hitler and the resistance of the judiciary and the Reichswehr. The court played an important role after the November pogroms in 1938, as it helped to cover up crimes and cover up criminals, thereby strengthening the Nazi dictatorship. After the trial against Josef Wagner, in which the court did not see any grounds for condemnation against the will of Hitler for formal juristical reasons, the power of the court was considerably reduced, especially since every judgement had to be confirmed by the party. In 1944 almost all proceedings were suspended. 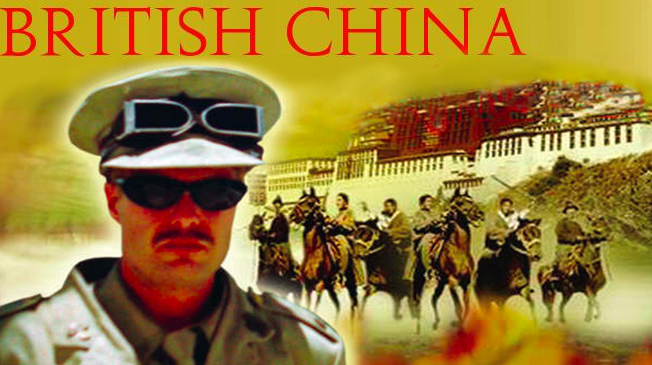 The building itself was destroyed during the war and completely rebuilt. 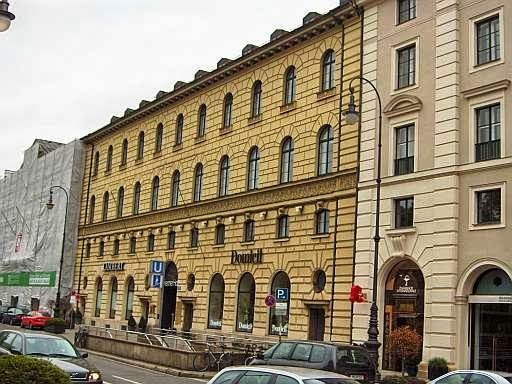 Now the the location of the Sparkassenverband Bayern at Max-Joseph-Straße 4, this served as the offices of the Nazis' Legal Department. 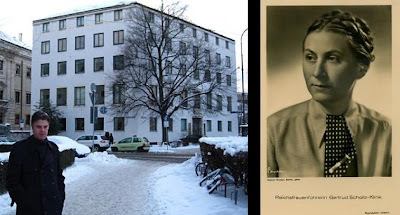 According to The Hitler Pages, in the summer of 1927 Geli Raubal's history teacher, Hermann Foppa, asked her if she could arrange a class meeting with her uncle. In the beginning of July the class went here to the villa of Elsa and Hugo Bruckman on the Karolinenplatz where they had the meeting with Hitler. With benefactresses such as Elsa Bruckmann and Helene Bechstein vying for his favour, Hitler was able to gain introductions to numerous public figures, including Richard Wagner’s daughter-in-law Winifred, who later became an enthusiastic supporter of the NSDAP. It was also in these circles that Hitler met his later personal photographer Heinrich Hoffmann, who was to heavily influence Hitler’s public propaganda image. One day I detected an unexpected reaction even in Frau Bruckmann. She had invited to her house, at the same time as myself, a very pretty woman of Munich society. As we were taking our leave, Frau Bruckmann perceived in her female guest's manner a sign of an interest that she doubtless deemed untimely. The consequence was that she never again invited us both at once. As I've said, the woman was beautiful, and perhaps she felt some interest in me—nothing more. 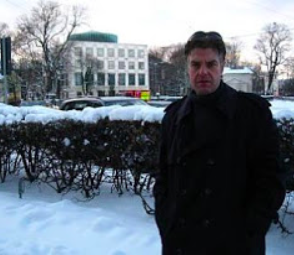 As a student in Munich, future Hitlerjugend leader Baldur von Schirach lived in the house of the publisher Bruckmann, who was friendly not only with his parents but also with Hitler." Fest (456), The Face Of The Third Reich. and that same day he told the architect, "When I come to power, you will be my architect. I have great plans in mind and I believe you are the only one who can carry them out for me." Troost did not however live long. As Hitler gave the obligatory three taps to the foundation stone for the House of Art (which still stands in modern Munich), the shaft of the silver-headed hammer broke, an omen of ill fortune of the highest degree, as the local architect Schiedermayer tactlessly whispered to the Führer in his dialect: "Dös bedeudt a Unglück." Münchners waiting around the obelisk to hear the result of the Munich conference of September, 1938. If the Feldherrnhalle honours those who fought against Napoleon, this obelisk in the Karolinenplatz commemorates the 30,000 Bavarian soldiers who were sent to fight for Napoleon and died in Russia. 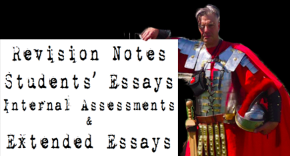 In some cases the unilateral celebration, that is, the uniquely anti-Napoleonic, requires a certain dialectic capacity and a particular creativity. 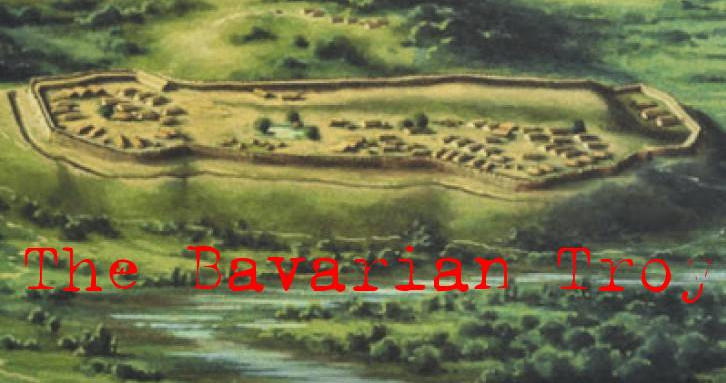 One example concerns the thirty thousands of Bavarian soldiers who died in the Russian campaign fighting alongside Napoleon. It is impossible to completely ignore such a tragedy. 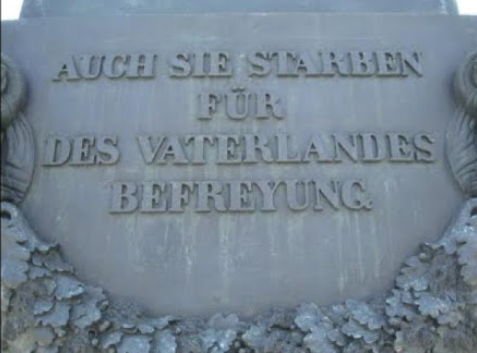 But when in 1833 the obelisk dedicated precisely to these fallen troops was added to the central round of Briennerstraße, the commemorative inscription read: “Auch sie starben für des Vaterlandes Befreiung”. The paradox crosses over into indiscretion: the fallen for Napoleon are transformed into those fallen in the wars of liberation against Napoleon. Another example comes immediately thereafter, literally “right around the corner”. The aforementioned Marshal’s Hall is found in the square on the corner of Briennerstraße, that is, Odeonsplatz. 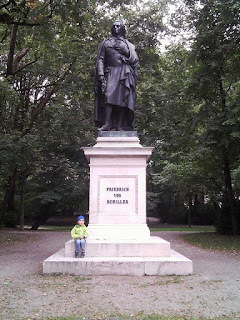 The statue of Generalfeldmarschall von Wrede celebrates the commander of the Bavarian troops in the French campaign of 1814, but contemporaries well knew that the same Wrede had first fought with Napoleon, from Wagram up until the Russian campaign. In his final speech before the court on March 27, 1924 during his putsch trial, Hitler declared: "It will be said one day, I can assure you, of the young men who died in the uprising what the words on the Obelisk say: 'They too died for the Fatherland!' That is the visual proof of the success of November eight, that in its wake youth rises like a raging flood and is united. That is the great success of the eighth of November: it has not led to depressed spirits but has brought the people to the highest pitch of enthusiasm. I believe that the hour will come when the masses who today bear our crusading flags on the streets will join with those on November eight shot at them." 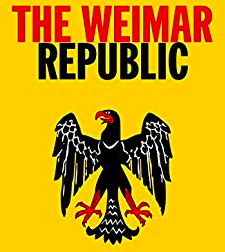 In fact, when Hitler often maintained in party circles that the victims of June 30 had died “for the liberation of the Vaterland,” he was alluding to the same inscription and had actually granted substantial pensions to the survivors of those slain on June 30, 1934. Looking towards Königsplatz from the base of the obelisk on Karolinenplatz during a march past the Brown House in 1932 and the scene today. Das Braune Haus behind the Temples of Honour shown on the left with part of the Führerbau. The Nazi Party Reich Office: Braunes Haus, Briennerstrasse 45, Munchen 33. It was named for the colour of the party uniforms. On the ground floor was displayed the Blutfahne ('Blood Flag') of the failed Munich beer Hall putsch of November 9, 1923. 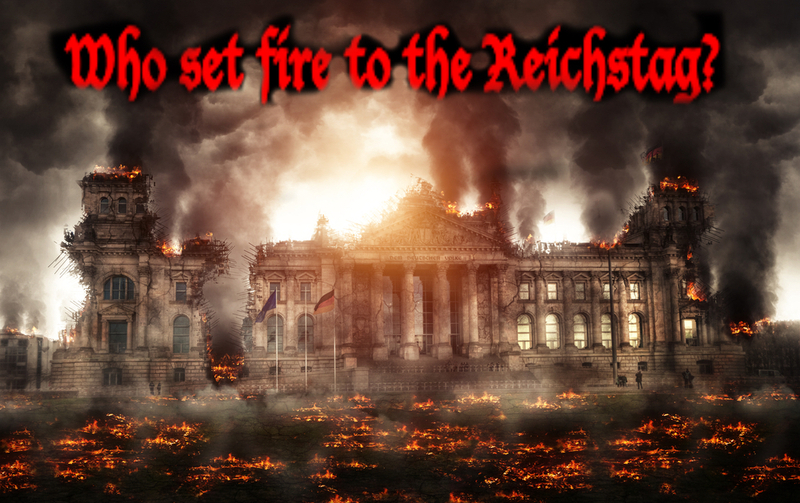 Hitler, then leader of the SA Ernst Rohm, and the party treasurer had offices on the top floor. After becoming Chancellor Hitler gave the building to Rudolf Hess. Also maintaining offices here were Hans Frank, Heinrich Himmler, Hermann Goering, Philipp Bouhler, and Franz Xaver Schwarz. 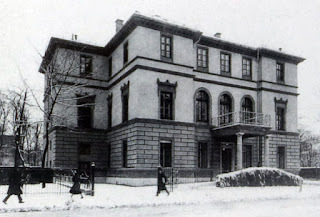 The former three-story, neo-classical Barlow Palace dated from 1828 in the plain Biedermeier style common in those times, and it was renamed the Brown House (for the colour of the SA uniforms) in 1931. It had once been the former Italian legation, and the Nazis converted the attics into another story. Architect Dr. Paul Ludwig Troost did the renovation. Sepp Dietrich had a room there, and sometimes the Führer stayed overnight. 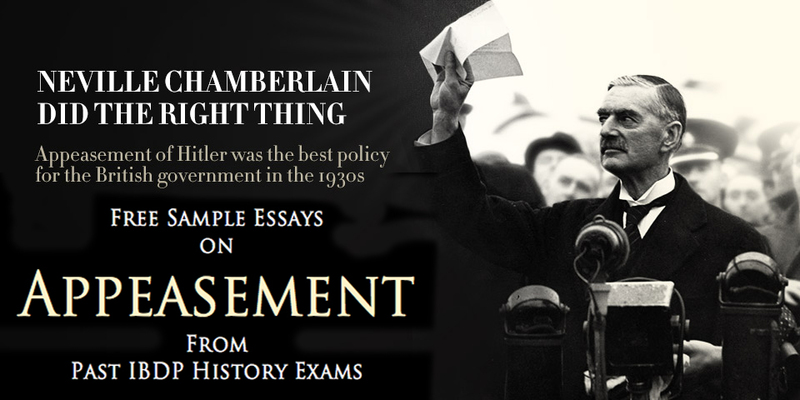 From the Brown House, Hitler executed his plans for the political conquest of Germany during 1929–33. 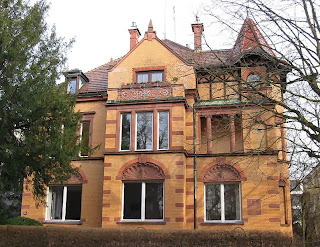 During 1933–35, a tunnel reportedly was built connecting the Brown House with the nearby Fuhrerbau, and it was from the Brown House that Hitler went by car to arrest Rohm and the other dissident SA leaders on “The Night of the Long Knives,” June 30, 1934. [Hitler] took over the Barlow Palace, an old mansion on the Briennerstrasse in Munich, and had it remodelled as the Brown House. A grand staircase led up to a conference chamber, furnished in red leather, and a large comer room in which Hitler received his visitors beneath a portrait of Frederick the Great. The Brown House was opened at the beginning of 1931, a very different setting from the dingy rooms in the Corneliusstrasse or the Schellingstrasse. With supporters inside. Hitler often ate his meals in the Brown House canteen with brown-shirted SA men seated on rustic Bavarian chairs. Besides Hitler’s own office on the second floor, there were also those of the SA chief of staff, the Party treasurer, and the Party administration. Hitler spent little time there, though, preferring instead to carry on Party business at his usual cafe and eatery haunts. 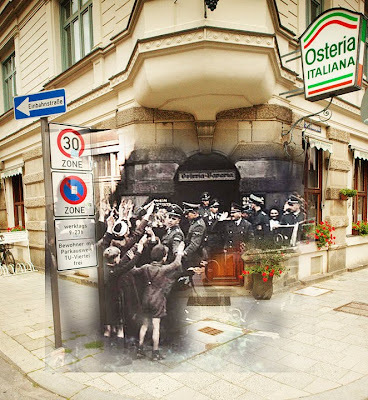 The photo on the right shows Hitler leaving the Brown House after the 1930 election results. At the right time, fate led to his meeting with his architect, Paul Ludwig Troost, with whom he soon formed a friendship based on an affinity of minds. What Dietrich Eckart was to The Leader as far as the exchange of ideas of a philosophical nature was concerned, Professor Troost soon became for him as far as architecture was concerned. The first building to arise through the unique combination of these two men, and also the first small construction of the Movement, was the Brown House in the Briennerstraße in München. It was only a renovation, but for that time, as The Leader sometimes related later, a massive undertaking. Here one can already see everything that was to be expressed even more distinctly in the buildings which were to be constructed after he came to power: severe and austere, but never monotonous. Simple and clear, and without false decoration. Ornamentation used sparingly, but in the right place, so that it could never be considered as superfluous. Material, form and lines combine to create an impression of nobility. Hitler's office and the "Hall of Flags" at the entrance. The Brown House at that time was a pompous villa kitted out in a not unpleasant way in something approaching imperial style; but it was quite useless for the purpose it was meant to serve. It did not have the right office rooms. Hitler’s work room was on the first floor, in the corner. The entrance led through a little room in which Hess worked. I don’t know if this word ‘worked’ is actually suitable here. 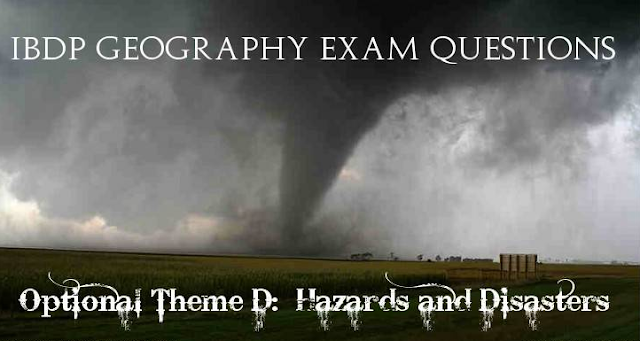 The first impression which I . . . had was of boundless disorder. Letters, newspapers, magazines, everything lay strewn around the room. . . .
At once I noticed that Hitler was notable in the Brown House by his absence. He ignored his colleagues and advisers completely and let them do whatever they wanted. He was only there to talk by chance about anything substantial, and only then about what interested him or about what he wanted to discuss. Already he had a special circle around him which was in no way identical with the office holders in the party. H. Nicolai, Mein Kampf ums Recht. Across the street from the Brown House was the so-called Black House- Palais Degenfeld- that served as the Apostolic Nunciature to Bavaria. 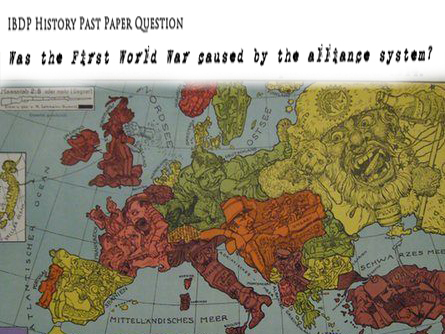 Under the Nazis, Bavaria was not to hold diplomatic ties of its own any more with the Vatican. Whilst its Apostolic Nuncio Eugenio Pacelli, the penultimate nuncio to Bavaria and future Pope Pius XII, managed to continue the nunciature to Bavaria as a kind of outpost of the nunciature to Germany, the Nazi government prompted the expulsion of the last nuncio to Bavaria in 1936. 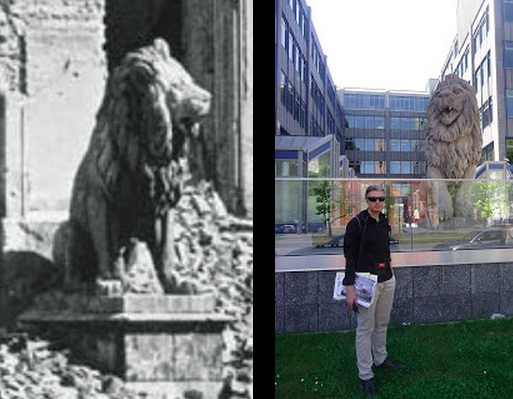 The building had been bombed in 1944 and later completely destroyed- today there is a large space where it was once located- the Verwaltungsbau is seen behind. Running off Briennerstrasse just outside the Alte Pinakothek within the Museumsquartier is the Türkentor, the only remaining section part of the Türkenkaserne barracks, built in 1826 for the Royal Bavarian Infantry Lifeguards Regiment. According to The Hitler Pages, on "October 8, 1914 a ceremonial farewell of Hitler’s regiment took place at the Türkenkaserne, with the king present." Just down the road on Türkenstraße 23 was the home of ϟϟ-Brigadeführer Reinhard Heydrich, at the time head of the Bavarian police and SD, and also served as the main office of the Sicherheitsdienst (SD). 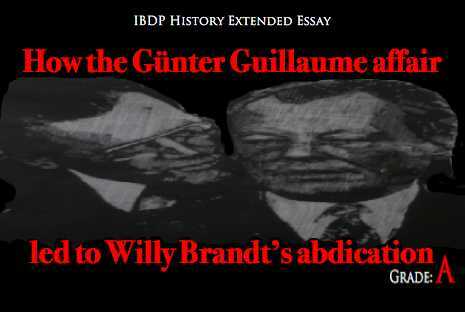 The SD was created primarily to identify and suppress plots against Adolf Hitler personally and against the Nazi regime generally. 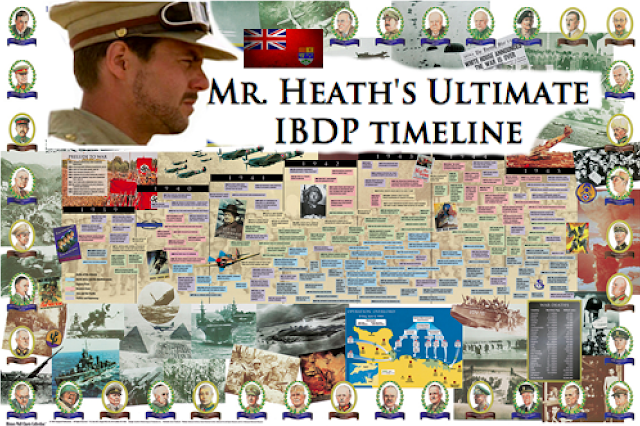 Under Reinhard Heydrich, the SD often exceeded its brief and conducted espionage abroad. 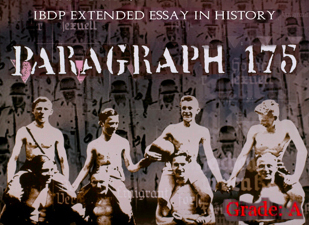 The SD operated as a rival agency to the Abwehr, much to the degradation of the quality of German intelligence. 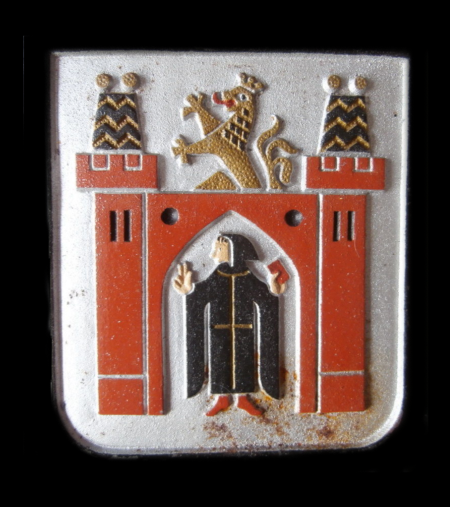 The Sicherheitsdienst (SD), “Security Service,” was the intelligence service of the Nazi Schutzstaffel (ϟϟ). From 1933 to 1939, the SD was under the Sicherheitspolizei (Security Police), then was transferred to the Reichsicherheitshauptamt (Reich Security Service Office, RSHA). The SD was created in 1932 by Reinhard Heydrich, who built it into a powerful organization that became the exclusive Nazi Party “information service” on June 9, 1934. 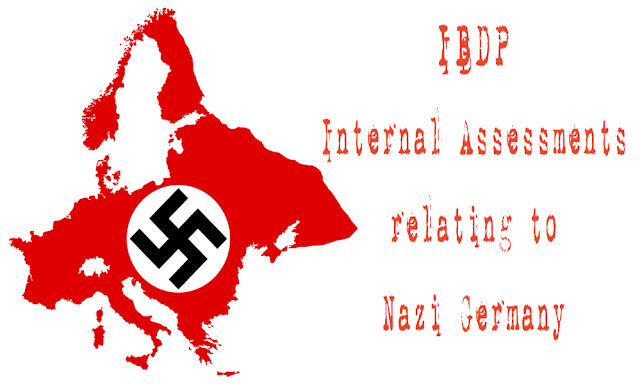 In 1938, the SD was made the intelligence organization for the Reich as well as for the Nazi Party. 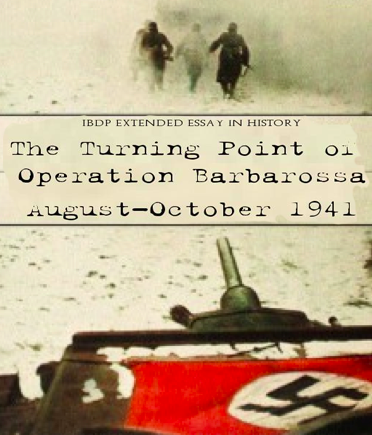 It worked in parallel with the Gestapo, which it supported with intelligence information. The mission of the SD was primarily to detect and eliminate those who would subvert or otherwise harm the Nazi Party and the Reich. The SD cultivated and managed a network of several hundred agents and thousands of informants throughout the Reich and, during the war, in the occupied territories as well. 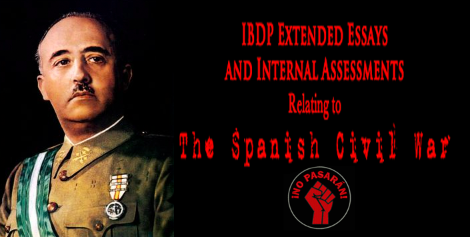 The SD was always primarily an intelligence-gathering agency serving the Gestapo, which was the executive agency. Ultimately, therefore, the SD came under the control of Heinrich Himmler, who, as chief of the German police, headed the Gestapo and was also the senior officer of the ϟϟ. The Munich Pinakothek is one of the most magnificent achievements in the world. It's the work of one man. 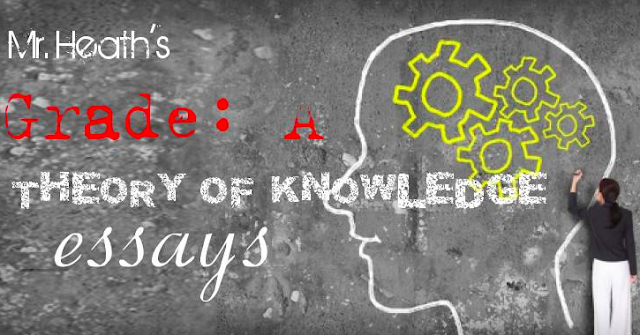 What Munich owes to Ludwig I is beyond computing. And what the whole German people owes to him! The palace of the Uffizi at Florence does honour not to Florence alone, but to all Italy. The midsection had been destroyed during the war and was reconstructed in 1952 - 1957 by Hans Döllgast. The restored section can clearly be seen today. Outside the building on the western side is the sculpture of the horse tamer (Rosselenker) by Hermann Hahn from 1928, its bullet holes serving as "scars of remembrance." 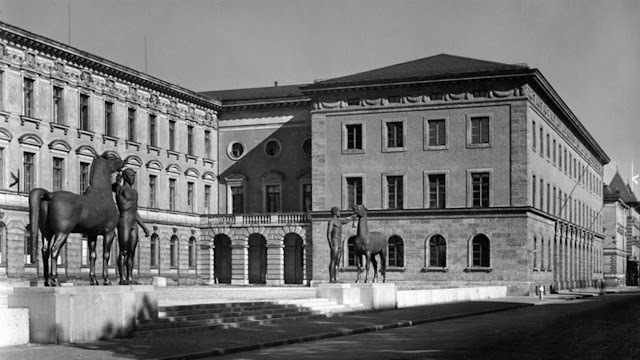 Before the war when the two horse tamers were placed in front of the Munich Technical College in 1931. After... and in their new positions across the street from each other. 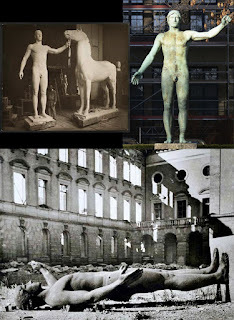 Bleeker's Rossebändiger was so badly damaged during the war that the horse was melted down. The Neue Pinakothek focusses on 18th and 19th century art for which it is considered one of the most important museums in the world. [W]ith the advent of war in 1939, the Alte and Neue Pinakotheken closed their doors to the public and the artworks were sent to the provinces for safekeeping. Although restoration work continued in the museums’ workshops through 1944, there were no wartime exhibitions to organise. It had been all but destroyed during the war and its ruins demolished in 1949. Designed by architect Alexander Freiherr von Branca, the new postmodern building shown on the right opened in 1981. 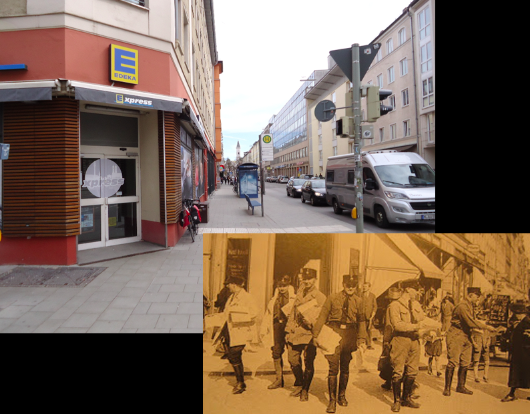 Schellingstraße during the wartime bombing and today. 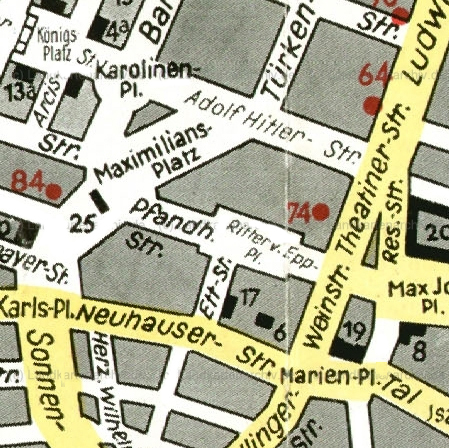 The street has a number of sites associated with the Nazi era. From 1936 to 1945, the lion was replaced by the Nazi party eagle- the Reichsadler. Deemed the Hauptstadt der Bewegung, Munich was a significant place in terms of the Nazi ideology. The city was home to the NSDAP headquarters, the Beer Hall Putsch and also saw the establishment of Dachau, the first Nazi concentration camp. Post-war designs were not pursued until 1949 with the current arms shown for comparison at right. This is where Hitler met Eva Braun for the first time as she worked in the new shop of Hoffmann, opened in 1913, on Schellingstraße 50. They first met in 1929, when he was 40 and she was 17. She worked in a Munich camera shop run by his official photographer, Heinrich Hoffmann. According to Hoffmann's daughter, Hitler's opening line was: "May I invite you to the opera with me, Fräulein Eva? You see, I'm surrounded by men and I know what a pleasure it is to enjoy female company." Eva was the middle of the three daughters of Fritz Braun, a master craftsman from Simbach on the Inn. She was a pretty, empty-headed blonde, with a round face and blue eyes, who worked as a shop girl in Hoffmann's photographer's shop. 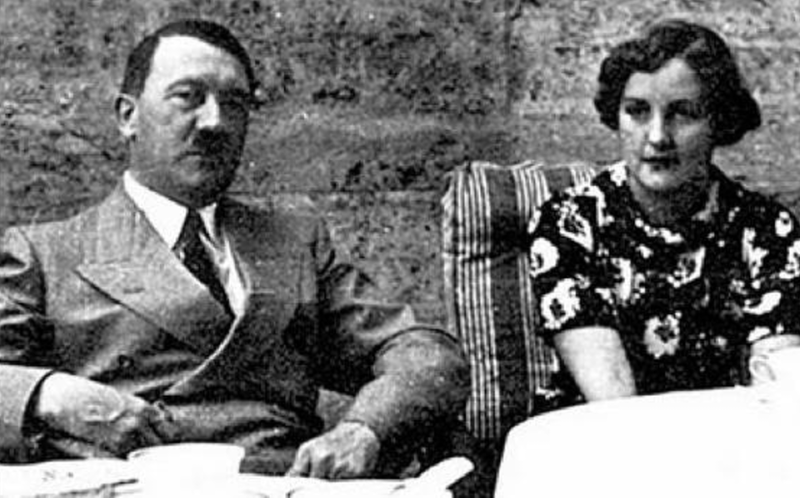 Hitler met her there, paid her a few casual compliments, gave her flowers, and occasionally invited her to be one of his party on an outing. The initiative was all on Eva's side: she told her friends that Hitler was in love with her and that she would make him marry her. Dates at the cinema and restaurants followed. 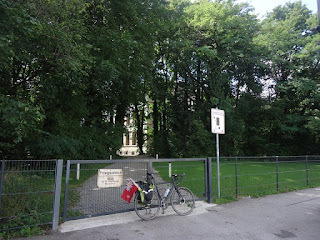 From 1925 until 1931 the NSDAP-headquarters were here. The Reichsadler is still above the door even though, as can be seen in the 'then and now' photos above, the exterior has been changed completely. Inside, with the Blutfahne flanked by two standards. The central photo shows Hitler conducting a meeting in the building 1928 during a leadership conference. Also present in the photo are Alfred Rosenberg, Gregor Strasser, Heinrich Himmler, Julius Streicher, and Robert Ley. Now the Osteria Italiana, this was apparently Hitler's favourite restaurant where he would have his "Stammtisch" and where he wooed Eva Braun who worked, one block down the street, as a clerk and bookkeeper, at Heinrich Hoffmann's photography studio. Clearly little has changed. It was here that, according to Irving (100) in Hitler's War, that "Hitler himself had sketched the rough outlines for the House of Art, using the back of an Osteria menu, one day in 1931 – a gallery of stern Grecian lines which even today is mocked as Munich’s 'Athens Station.’"
[Hitler] is in agreement with everything. 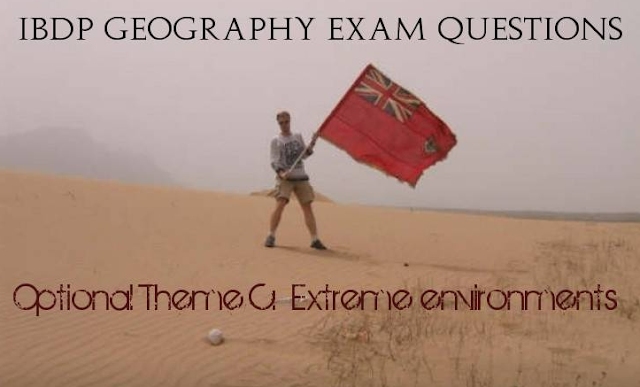 His views are quite radical and aggressive. The Aktion itself went off without a hitch. A hundred dead. But no German property damaged.’ Each of these five sentences was untrue, as will be seen. With minor alterations the Führer authorizes my decree re: breaking off the Aktionen. I issue it immediately through the press. The Führer wants to proceed to very harsh measures against the Jews. They must repair their shops themselves. The insurance companies will pay them nothing. Then the Führer wants Jewish businesses gradually expropriated and their owners compensated with paper which we can [word illegible: devalue?] at any time. Meanwhile people are starting with their own Aktionen. I issue appropriate secret decrees. We’re waiting to see the repercussions abroad. For the time being there is silence there. But the hullabaloo will come. Henriette von Schirach described the restaurant as a “cool, small winery with a little courtyard painted in Pompeian red and a ‘temple,’ that is, an alcove with two columns in front of it,” which was kept reserved for Hitler. 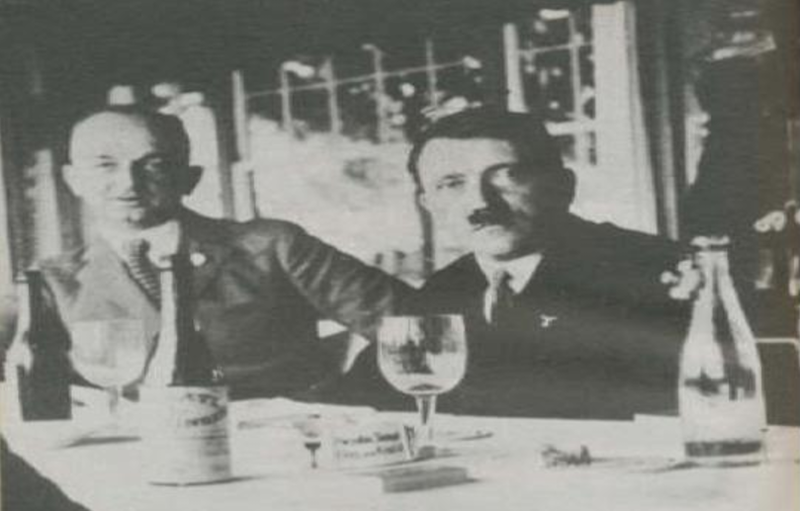 However, Hitler’s later secretary, Traudl Junge, said that the Nazi leader’s regular table was the “least comfortable table all the way in the back, in the corner.” Hitler rarely ate alone. His constant companions from the early 1920s on included not only Heinrich Hoffmann but also Ernst Hanfstaengl, a German‑American who was named head of the Party’s Foreign Press Bureau in 1931. Hitler’s Munich circle in the early years also included Adolf Wagner, the powerful Gauleiter of the Munich–Upper Bavaria region, called the “despot of Munich”; Julius Schaub, Hitler’s personal assistant; Christian Weber, a “potbellied former horse trader” (in Joachim Fest’s words) and good friend of Hitler’s; and Hermann Esser, a founding member of the NSDAP, whom Goebbels called “the little Hitler.” Later additions included Martin Bormann, Otto Dietrich, ϟϟ General Joseph “Sepp” Dietrich, Max Amann, and Wilhelm Brückner (an SA‑Obergruppenführer and Hitler’s chief adjutant since 1930). Hitler with Unity Mitford at the Osteria.Her sister Diane married Sir Oswald Mosley, leader of the British Fascist Party, made it her business to meet Hitler here. In 1934 she stalked him in Munich where he noticed her at the Osteria Bavaria (today “Osteria Italiana”) at Schellingstrasse No. 62. Ward Price described her with these words: “No one could sit for long in the same room as Miss Unity Mitford without noticing her. Her golden hair, fair skin, and blue eyes attain the highest standards of that Nordic beauty which Germans especially admire.” On one occasion, Hitler sent his adjutant Brückner to her in the Osteria Bavaria to convey the chancellor’s compliments. This marked the beginning of a friendship, which soon was to be platonically extended to her sister, Diana Guinness. Shortly after the war broke out, Unity Mitford attempted to end her life by shooting herself in the temple in Munich’s “Englischer Garten.” Hitler ordered the best doctors to her side. 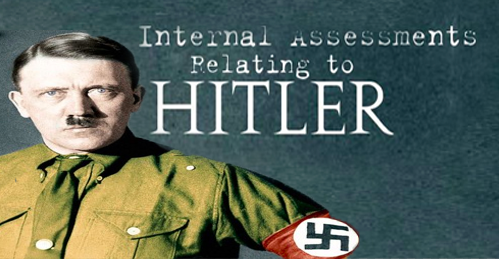 After her health was restored, Hitler’s personal physician Morell brought her to Switzerland. From there, she returned to England where she died in 1948, as a patient in the Oban Hospital. One tacit agreement prevailed: No one must mention politics. The sole exception was Lady Mitford, who even in the later years of international tension persistently spoke up for her country and often actually pleaded with Hitler to make a deal with England. 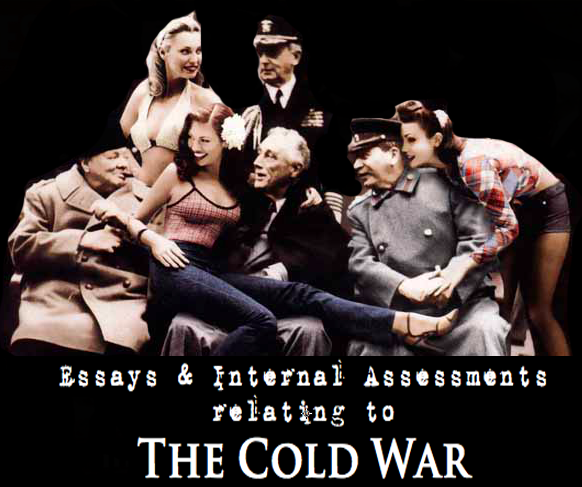 In spite of Hitler's discouraging reserve, she did not abandon her efforts through all those years. Then, in September 1939, on the day of England's declaration of war, she tried to shoot herself with a small pistol in Munich's Englischer Garten. Hitler had the best specialists in Munich care for her, and as soon as she could travel sent her home to England by a special railroad car through Switzerland. 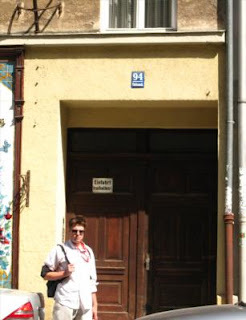 The non-descript address here at 94 Turkenstraße off Schellingstraße was where, in 1939, Georg Elser rented a room before attempting to blow up Hitler at the Bürgerbräukeller on November 8 1938, the day of Hitler's annual speech on the anniversary of the Beer Hall Putsch. Given the demands of the war and forecast of fog preventing him from flying back to Berlin the next morning, Hitler decided to return to Berlin the same night by his private train. With the departure from Munich's main station set for 21:30, the start time of the event was brought forward by half an hour to 20:00 leaving Hitler to cut his speech from the planned two hours to a one-hour duration at 21:07, 13 minutes before Elser's bomb exploded at 21:20. By that time, Hitler and his entourage had left the Bürgerbräukeller. The bomb brought down part of the ceiling and roof and caused the gallery and an external wall to collapse, leaving a mountain of rubble. About 120 people were still in the hall at the time leaving seven killed. Another sixty-three were injured, sixteen seriously, with one dying later. Hitler did not learn of the attempt on his life until later that night on a stop in Nuremberg when told of the bombing by Joseph Goebbels. Hitler would later declare: "Now I am completely at peace! My leaving the Bürgerbräu earlier than usual is proof to me that Providence wants me to reach my goal." Nearby a square is named in his honour and yet for a long time Elser was unacknowledged; nor was he himself commemorated. Starting in the late 1960s several attempts were made to have a street named after Elser. 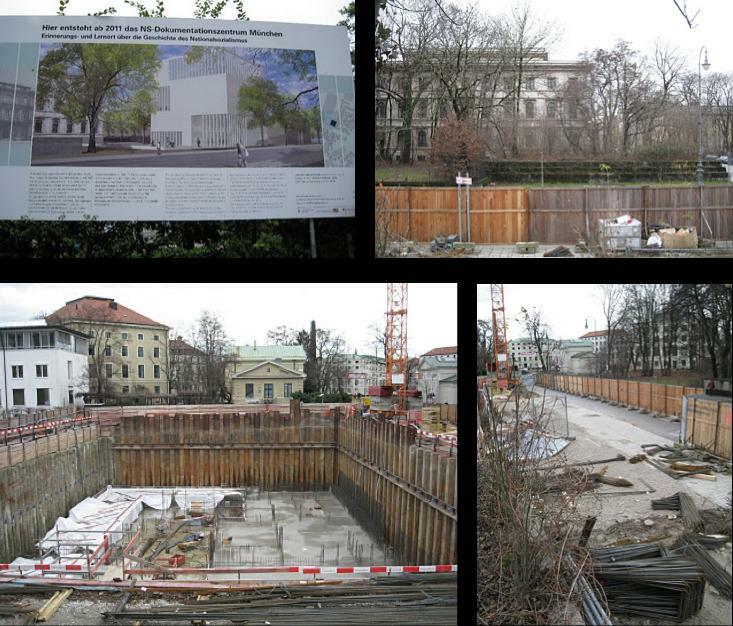 It was not until January 1997, however, that a small square off Türkenstraße that Elser had passed every day on his way to the Bürgerbräukeller was named Georg-Elser-Platz, chiefly thanks to the unflagging efforts of the Munich Georg Elser Initiative. To mark the seventieth anniversary of the assassination attempt in 2009, moreover, a permanent art installation mounted on the façade of the school building on Türkenstraße adjacent to the square was also dedicated to Georg Elser. The neon lettering reading “8 November 1939” by Silke Wagner was the winning entry in a competition held by the city’s Department of Art and Culture. “Georg Elser,” says Silke Wagner, “earned himself a place in the history of resistance to the Nazi dictatorship. The object of the memorial can only be to remind people of this. The work directs the viewer’s gaze to the most important thing – the assassination attempt.” Each day at exactly 21.20, the time of the explosion, the red neon tubes light up one after another, writing the historic date 8 November 1939 in lights. Exactly a minute later the lights go out again and the work “disappears” from public view. The abstract monument thus confines itself to the central message and through this deliberate reduction interrupts our habitual view of the square, alerting us to that single moment when the history of the twentieth century might have taken a different course. An earlier memorial to Georg Elser was installed in the pavement in front of the building housing the GEMA – the fascistic music performing rights and copyright authority that prevents any form of music from being enjoyed in Germany unless being paid for the privilege first– in 1989. At #57 the name and bulldog logo of which provides a link to the Private Eye-type satirical magazine Simplissimus, banned in 1944 by the Nazis for being critical of them.